Remember the days of Halo: Combat Evolved? Remember getting stuck running in circles because all of the environments looked the same? Well, you can forget that because right off the bat the world design in Rise of Iron looks fantastic. In the very first story mission, we’re treated to snow-capped peaks, rickety machinery, and for fans of Iain Banks, a gondola that reminds me of the gondola in Against a Dark Background. The first mission of the Rise of Iron campaign is called King of the Mountain – beating it will unlock the “Mountain Climber” achievement. Climbing Felwinter Peak in the middle of a blizzard gives you a real sense of vertigo, and the white-out conditions of the craggy, crevassed mountain ridge are a wonderfully atmospheric to the already-great environments that Destiny has to offer. It makes a great playable space, too. Defending the Iron Temple from hordes of Fallen feels just as Game-of-Thrones-epic as we hoped it would. Now, if you do decide to watch the video, there a few questions to keep in mind – not the least of which is how a 400 year-old gondola is still functional. The second, and more important question, is: Sepiks is pretty obviously already SIVA-fied. Why doesn’t Saladin want it going inside the Iron Temple? Is there something else that’s hidden in there? Note that after completing the “campaign” missions, a bunch of new quests also open up for the player. How in-depth they are remain to be seen, but the prospect of new secrets to discover – SIVA clusters, exotic weaponry, and new characters to meet – is mouth-watering for Destiny fans that have been pining for narrative development. You’ll begin this first story mission by entering a mountainous area and, under Lord Saladin’s instructions, making your way to a gondola that takes you up toward Felwinter Peak, where a Fallen incursion has been detected. Fallen are everywhere along the way, even shooting at you in the gondola, so keep your eyes up! Scout Rifles and Snipers, the load-out showed in the video, are definitely recommended here as there’s a lot of longer range fighting. Eventually a Fallen ship blows a hole in the gondola and you have to jump out and make your way the rest of the way up on foot to defend a courtyard outside the entrance to the Iron Temple. After fighting off a few enemy waves, you encounter Sepiks Perfected, whom you must prevent from gaining access to Felwinter Peak. It seems the rebuilt Servitor is regenerating due to the SIVA influence, though this is not openly stated at that point. Aside from a new triple burst shot, he doesn’t seem to have learned any new tricks and goes down fairly easy, granting you grimoire and access to the Temple. The Fallen we encounter throughout are the standard ones we’re familiar with, not the Splicers, so either Bungie is pacing out the introduction of threats or we’ll still be seeing a number of standard Fallen throughout, just as the standard Hive supplemented Oryx’s Taken forces. However, the atmosphere and environment on the way up is amazingly detailed and starkly beautiful, with stunning views of the landscape and snowy particle effects throughout. Although the informative cutscene that will follow the opening story mission is being held back so you can experience it in-game, the video above gives us a clear picture of what to expect. It seems like a straightforward and simple introduction, but it undoubtedly does a good job at preparing us for the rest of the storyline and challenges to come. Remember that this isn’t really a new strike but a re-skinned and slightly-altered version of the old House of Devils strike we all know and love. The biggest changes are in the enemies you face and in some of the environments you encounter. Bungie has made it a bit more difficult to play it safe, so you’ll have to find new places to take cover as you fight your way through the Devil Splicers. The enemies sport new weapons and new elemental shields (you’ll have to reconsider your choice of secondary and heavy weapon, at the very least), and all in all it’ll be a much more difficult Nightfall strike, should it be part of the rotation. But again, the environment stands out. Rampant SIVA growths have infiltrated the familiar level design, and you’ll have to make your way past some new hazards as you move through the encounter. The snowy Plaguelands give an additional sense of foreboding to run-down Old Russia, and the high-contrast red of the SIVA infection is both ominous and compelling. The largest change is in the boss fight with Sepiks Perfected. Bungie has introduced a new mechanic that adds some welcome complication to the original bullet-sponge format. Sepiks now sports its own elemental shield, and the player will have to use a special SIVA-fied scorch cannon dropped from a Splicer Captain in order to take it down. You’ll also note the inclusion of the new, strike-specific “Skeleton Key” chests, from which much sought-after loot can now drop. Lore-wise, I’m excited to learn more about what it really means to be “Perfected,” which is a moniker we see applied to a host of Fallen Splicer enemies. We know from Bungie’s official copy that the Devil Splicers are “Attempting to become machine gods themselves,” but we’ll have to wait until the 20th to learn whether or not they’ve actually succeeded. That said, the new dialog that accompanies the completion of the strike is tantalizing. What is SIVA, really? Who or what is behind its release? And what will we discover once we brave the Wrath of the Machine? “Perfected” or not, the new spliced enemies can still be defeated, and I can’t wait to take them on with the new weapons we’ve been teased. 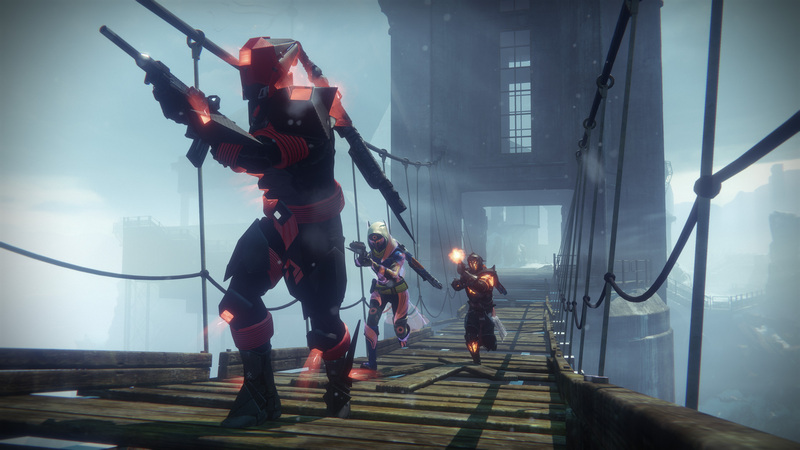 Getting the player to feel “Epic” as all get out has always been one of Destiny’s hallmarks, and it looks as though Rise of Iron will deliver on its promise to make us feel like a true Iron Lord or Lady.